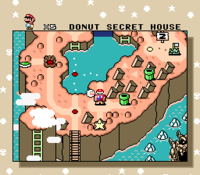 Donut Secret House is a secret Ghost House in the game Super Mario World. It can be accessed by completing the secret exit of Donut Secret 1. This level also has a secret exit. This level is the home of the Big Boo, the boss who protects the Star Road. If the Mario Bros. beat this boss, they'll have access to the Star World. This level consists of two main rooms, a boss room, and a hallway used to reset the second room which the player has 400 seconds on the Timer to clear. This level contains no Dragon Coins. 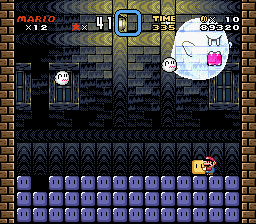 In the first room, the player will have to avoid 10 Boo Buddies floating in circles. After the Boo Buddies, the player will encounter an Eerie and a Big Blue Boo. If the player activates the P Switch, the Block will turn into a coin, and the Jumping Board that was on top of it will fall down, allowing the player to jump over the Big Boo easily. There is then a series of staircases for about 10 seconds. Just before the player reaches the end of the first room, a platform underneath the last staircase is visible with a Dragon Coin and a ? Block however the staircase refines the player from entering the platform at this stage and can only be entered later on. Donut Secret House is one of two ghost houses in Donut Plains. After traversing the first room left-to-right, and entering the second room, there will be a circular arrangement of Boo Buddies. There will then be a small platform with five coins on it. In order to get to the normal exit, these coins must first be taken, and then the P Switch obtained from the leftmost end of the room, brought back to the small platform, and activated. A blue door will then appear, through which is the non-secret goalpost. In order to get to the secret exit, the player needs to obtain the P Switch, bring it to the arrangement of Turn Blocks with a door in the center, and activate it. A row of ? Blocks will appear, making it possible to stand on what was previously empty space. The player needs to stand on the middle ? Block and hit the Turn Block immediately above. A beanstalk will then appear, which must be climbed. At the top is a long platform extending to the right, and there is a blue door at the right end. (The P Switch must not have timed out in order for the door to still be there.) The door leads to a battle-room, where there the Big Boo and his two Boos are in the room. The Big Boo must be defeated by throwing at him the Grab Blocks that make up the floor. The boss is harmless to the players but the regular Boos are not. The player must be careful not to create a hole in the floor and fall through it. After The Big Boo is hit three times, he will be defeated, leading to Star World 1. Spanish Casa Rosquisecreta Rosquisecreta is a pun between Rosquilla (Donut) and secreto (secret). Casa means "House". This is the only level to have a boss battle other than a castle or a fortress. This page was last edited on April 9, 2019, at 02:46.